Last weekend I found myself wandering around Abergavenny with my daughter. Shopping, soaking up the sun (surprisingly) and looking for something I might be able to talk about on this blog. I ended up with a few things to talk about. One bad experience but also one or two brilliant discoveries. Elm Tree Foods pies being one of them! I found Elm Tree Food outside Abergavenny Indoor Market in a little pop up tent. Pies neatly arranged in front of me, I couldn’t resist buying at least one. All of them made with a shortcrust pastry, how could I resist. Much better than the puff pastry you get in most restaurants. At first, I bought two pork pies, one for me and one for my daughter to eat now, a steak and Stilton pie with a rich and meaty gravy and a Butternut Scrunchie pie. The Butternut Scrunchie was recommended to me as the more unusual option – containing roasted squash, feta cheese and balsamic onions. So me and my daughter found a bench and tucked into our pork pies. Now I am not normally a fan of pork pies. The ones I am used to are full of fat, no distinguishable flavour and the meat is closer to a hard pulp of ground up meat. These, on the other hand were fantastic. I am not exaggerating when I say these are by far an away the best pork pies I have ever eaten. Possibly the best pies.. Period. They are incredibly moreish and immediately after finishing these pork pies, I went back for more. The pies are obviously well seasoned, full of herbs and a few spices but I wanted to know more. I asked what was in it and he says his ‘secret’ ingredient is fennel seeds. “Not too much, just enough to make you notice” he said. Whatever it is, it worked. I’ve eaten another one whilst typing this. I also asked if he was a regular at Abergavenny Market and thankfully he sets up stall every Saturday. I would return to their stall for the pork pies alone but the other pies were incredible too. 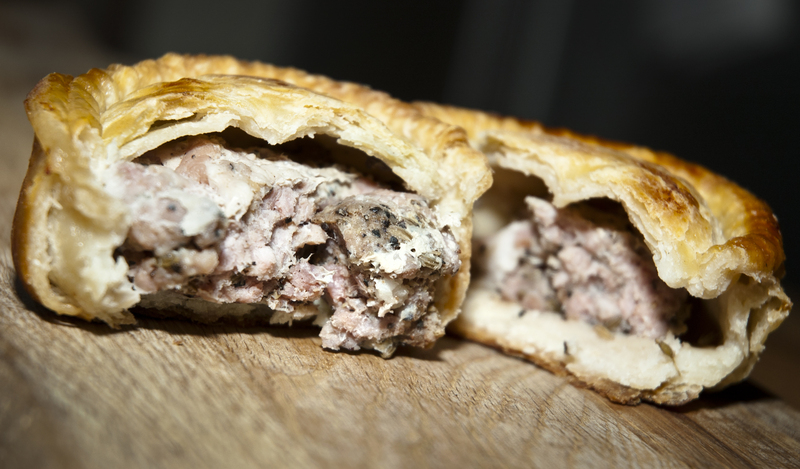 I saved the Steak and Stilton and the Butternut Scrunchie pies for my tea that night… I was not disappointed. 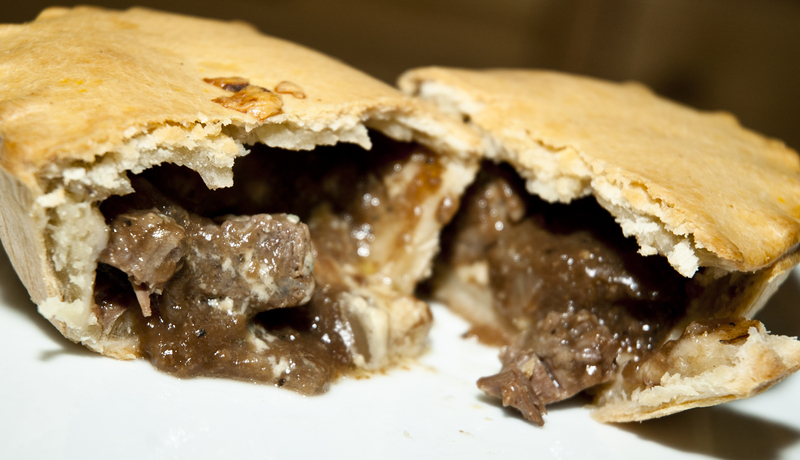 The Steak and Stilton pie was everything you would expect from a good pie and more. The pie was stuffed with filling. Rich and flavourful gravy, big chunks of tender meat and the Stilton adding that extra something to elevate it to the next level. The Butternut Scrunchie was equally beautiful to look at and packed with an entirely different but tasty filling. 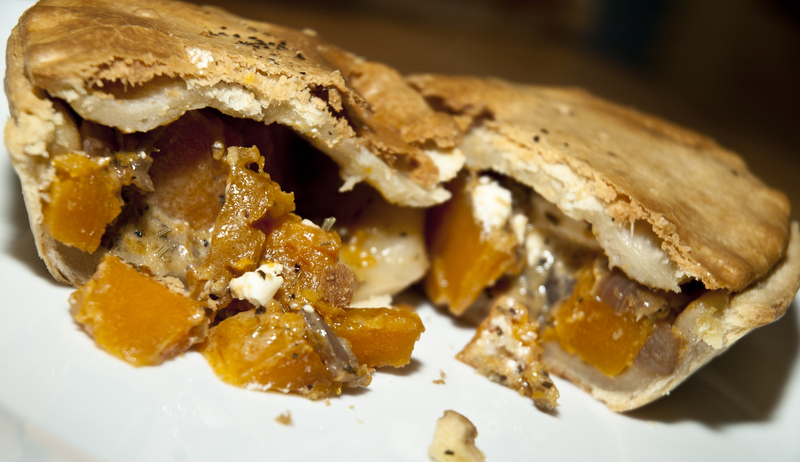 The sweetness of the butternut squash working perfectly with sharpness of the feta cheese and balsamic onions. There is no doubt that I will return to Elm Tree Foods stand in Abergavenny to try more of their pies and I urge you to go try them too. You won’t regret it. Update: I have just been informed by Elm Tree Foods that they have recently opened a bakery (@GriffithsBakery) in Newport for those of you that are unable to travel as far as Abergavenny. Even more pies!